Defining the "Circle of Death"
By definition the “Circle of Death” is the hardest Tour de France stage in the Pyrenees Mountains. It is a place where hopes for the overall victory die. Since 1910 the Tour de France has included an incursion into the high passes of the Pyrenees Mountains. Stage ten in 1910 included four brutal climbs, featuring the first ascent of the Col du Peyresourde, the Col d'Aspin, the Col du Tourmalet, and the Col d'Aubisque. The press wrote of the new stage routes into the wilderness of the Pyrenees as “dangerous” and “bizarre.” Of course this was much to the delight of race director Henri Desgrange and his sponsoring newspaper Le Auto. July 27, 1910 was a very hot day in the south of France and race officials anxiously waiting at the top of the Aubisque watched to see if any rider could make it over both the Tourmalet and the Aubisque. Lapize a climbing specialist walked, ran, and pedaled his way up the climbs. Local rider Francois Lafourcade passed him and won the last climb. Fifteen minutes after Lafourcade, the second rider, Octave Lapize, appeared in great distress and pushing his bike. Upon reaching the top Lapize angrily shouted “ASSASSINS...” at the race officials as he passed. Across the top of the Aubisque Lapize was able to recover, catch Lafourcade on the way into Bayonne, and win the stage. Octave Lapize went on to earn a grand victory in the 1910 Tour de France and Henri Desgranges saw the new ‘mountain formula' become a great success. With the inclusion of the dangerous Pyrenees Mountains and the riders shouting “Assassins...” and “Murderers...” Tour legend was made in 1910. The press contributed tremendously to the legend by naming the hardest day in the Pyrenees “The Circle of Death”, where hopes of a Tour de France victory go to die. 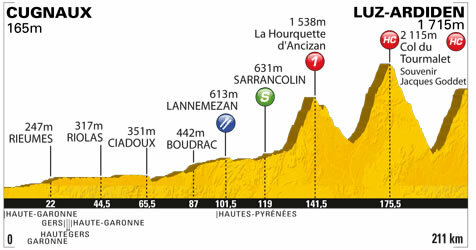 Stage 12, a 211 km jaunt over a category 1 climb and two Hors Category climbs, finishing at the summit of Luz Ardiden. 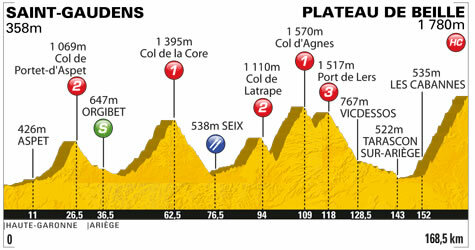 Stage 14, a shorter 168.5 km jaunt over a category 3 climb, two category 2 climbs, two category 1 climbs, and a finishing Hors Category climb at the summit of the Plateau de Beille. Which stage will prove to be defined as the entry into the 2011 Circle of Death is a matter for discussion. Legend has it that the Tour is never won before the Alps, but for sure this year's entry into the Circle of Death will see more than one Tour contender's GC hopes die. In 1913 virtual race leader Eugene Christophe (the original Eternal Second) crashed heavily on the descent of the Col du Tourmalet broke his front fork and ran 6 miles to the nearest town for repairs. He lost 3 hours and any chance for the overall victory. In 1936 Belgian Sylvere Maes destroyed the second and third placed riders by more than 20 minutes to secure the overall title. In 1969 Eddy Merckx scored his greatest triumph. As race leader, Merckx dropped all his rivals over the Col du Tourmalet and rode solo for 130 kilometers to win the Circle of Death stage by an unheard of 7'56” lead. Merckx crushed everyone else's Tour hopes in Mourenx. In 1991 the Col du Aubisque marked the start of what would be Miguel Indurain's drive to five consecutive Tour wins. Defending champion Greg LeMond tried to repeat his attack on the Col du Tourmalet, but cracked on the Aubisque. He lost over seven minutes to Indurain, and was never again to wear the yellow jersey. In 1995 the Tour de France's "Circle of Death" stage claimed the life of Fabio Casartelli. He died from head injuries suffered in a crash on the descent of Col de Portet d'Aspet in the Pyrenees. In 1996 Bjarne Riis put a strangle hold on the race with a commanding performance. On the stage that finished at the summit of Hautacam, Riis used continual surges on the steepest section of the road and dropped everyone, including the defending champion Miguel Indurain. The stage signaled the end of Indurain's five-year Tour reign. The “Circle of Death” has claimed more than one contender over the years.